Creator Kyle McGetrick originally made a Tiki Toss smartphone game, and fans loved it so much they asked him to create the real thing. This is a simple, addictive game for parties, barbecues, and other gatherings—indoor or out. 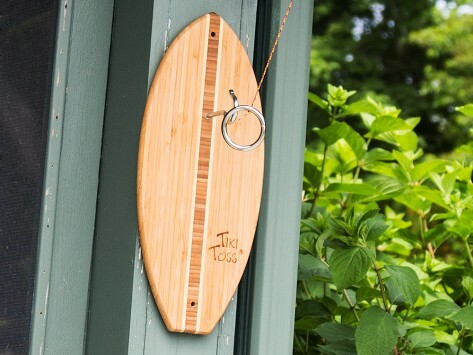 Swing the ring on a string, and try to hook it on the Tiki Toss board. Follow the preset scoring rules or make up your own. Dimensions: 14.5" x 6.25" x 1"
Our family has always loved this game, so I was excited to see it on The Grommet. We use it all the time. Got this for our bar and it provides hours of competitive fun! Very easy to make a purchase on thegrommet...The game is great ! !